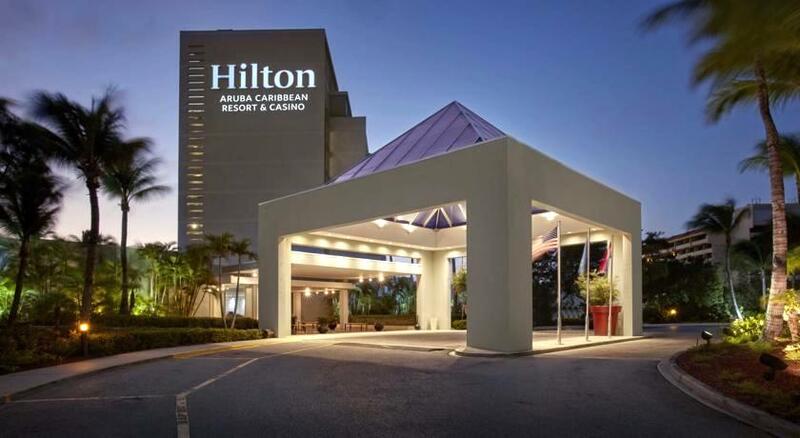 Great news for fans of the Hilton hotel chain: renovations at the Hilton Aruba Caribbean Resort & Casino are almost finished. The hotel is about to relaunch in mid-December, just in time for Christmas 2016. The renovations at the Hilton – formerly known as the Radisson until it was acquired in the summer of 2015 – started in March 2016 and cost a whopping 25 million dollars. Highlights of the huge renovations include a brand new beach tennis court near the pool deck, new lush landscaping near the beach, a new lobby with a breezy open air lobby lounge, and a completely new design for all 355 rooms and suites. Both the Laguna Restaurant and the Sunset Grille have been redesigned, offering new culinary masterpieces food aficionados will love. Guests who’d like to stay connected during their vacation in Aruba will appreciate that Wifi too has been upgraded to Hilton standards. Hundreds of original Aruban artworks are now scattered throughout the hotel to pay homage to the hotel’s history. 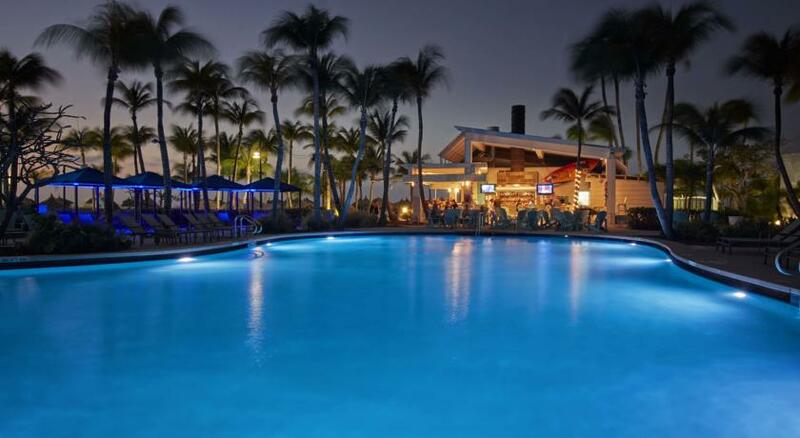 And that history is quite a long one: did you know that nearly 60 years ago the Hilton Aruba, known as the Aruba Caribbean Resort back in the day, was the first Aruba luxury hotel ever to be built on Palm Beach? 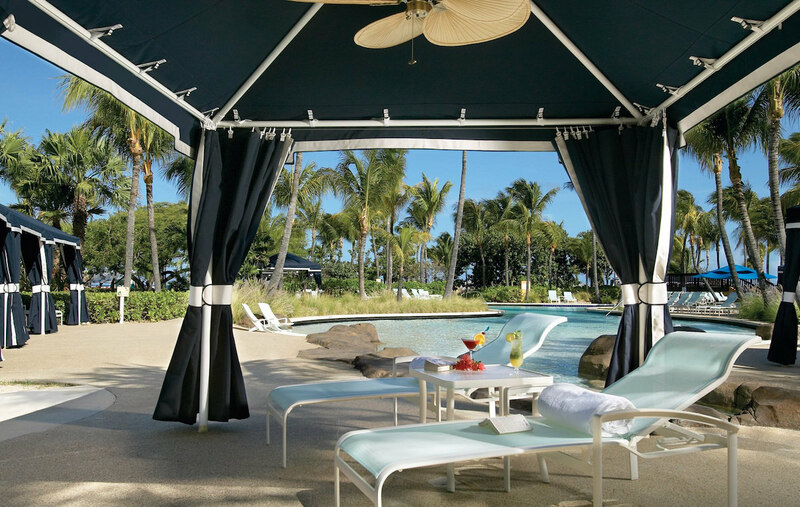 It was originally designed by Morris Lapidus, an architect best know for designing some of South Florida’s most glamorous hotels in the 1950’s and 60’s. Among them is the renowned Fontainebleau on Miami Beach, which was built in 1954. Management at the Hilton Aruba has made sure that the new design will continue honoring the work of the Russian-American architect. Both the active and passive beachfront pools at the Hilton have been redesigned with new anti-slip tiles and fresh coatings. The pool decks now have new day beds with side tables, new comfortable lounge chairs, hammocks, and umbrellas. Both freshwater pools are still easily accessible from the beach and are still child-friendly (note that children always should be accompanied by an adult.) Both pools are open from 8AM to 10PM. Near the pools on Palm Beach, you’ll find a new beach tennis court for some hot beach action. 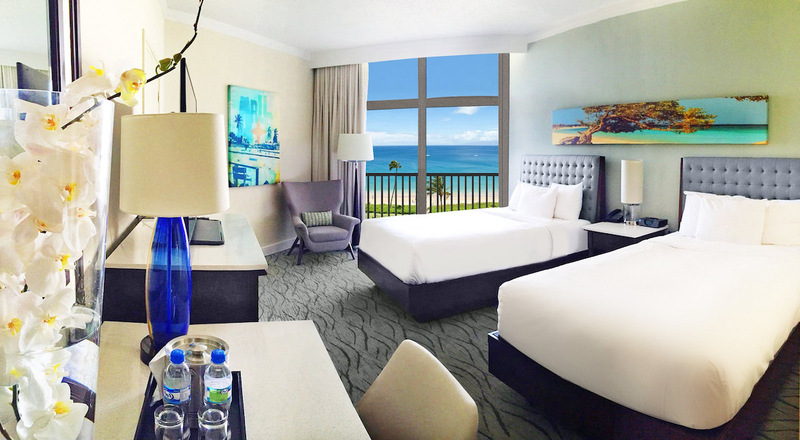 All guest rooms and suites at the Hilton Aruba now feature new wooden furniture, carpet, curtains and wall decorations in colors that perfectly compliment the spirit of the Happy Island. All bathrooms have been completely overhauled as well. New high-definition televisions now have a size of 50 inches and can be viewed from comfortable beds with new lavish blankets and pillows. The seating areas on the balconies and patios have been equipped with brand new furniture. The lobby area has been completely redesigned as well and now serves as a more lively area both at day and night. It has been split into smaller sections for more intimacy. A combination of lush greeneries has been added, which makes the area feel like it’s a natural extension of Aruba’s landscape. At the retail section of the lobby, a new seating area has been added with umbrellas. At the entrance to the hotel’s garden, there’s a new wooden deck with new lounge chairs, side tables, and decorative planters.